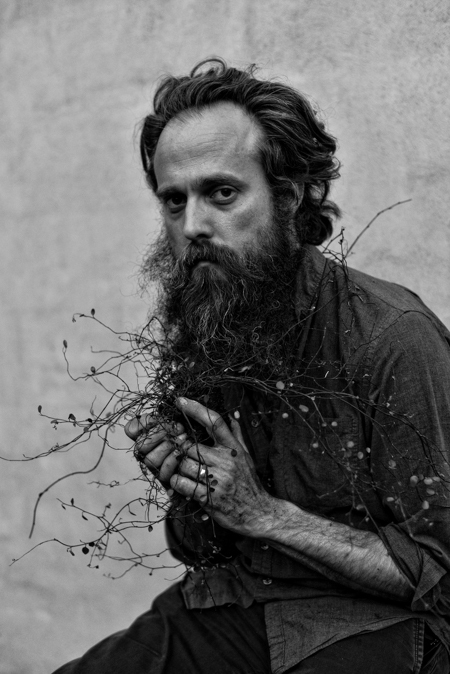 Last year Iron & Wine released one of our favorites and Best Albums of 2017 with its Grammy-nominated album Beast Epic. We loved it on first listen, but the album continued to grow on us with months and months of repeated listens, sewing many ear-seeds and bearing bushels of musical fruit the longer we listened. Such are the songs of Sam Beam. Why just last week we marveled at Beast Epic‘s resiliency. People: the album comes highly recommended. And give it lots of time to gestate. Now comes good news: Sam Beam and pals (Joe Adamik, Jim Becker, Rob Burger and Teddy Rankin-Parker) will on 8/21 release a follow-up EP entitled Weed Garden on Sub Pop on August 21st. The band’s press release indicates that Weed Garden features six songs written during the Beast Epic phase that weren’t completed until coming to fruition now. Based on the first song below, the wowing What Hurts Worse (lyrics at bottom), the new release is definitely a part of Beast Epic and yet furthers Iron & Wine’s stunningly good discography. Listen to What Hurts Worse below in all its melodious, well-coiffed beauty. Weed Garden is now available for preorder on CD/LP (limited amber versions)/DL/CS on Sub Pop HERE. Finally check out (below the video) the tour dates (including Cali in late September) of the band’s world tour this fall. Tomorrow is Quatorze Juillet (Bastille Day), which for us marks the end of the first half of the year. And it provides the perfect excuse to ensnare you with our Best Songs of 2018 (so far). Check all the songs out above. You will find the list dominated by songs from Damned Devotion a career-best album from the sensational Joan As Police Woman. Damned Devotion will undoubtedly be near or at the top of our Best Albums of 2018 list at year’s end. Joining Damned Devotion will doubtlessly be this year’s albums from Australia’s nascent Middle Kids (Lost Friends) and from the always-reliable Okkervil River (In The Rainbow Rain). Each is well-represented in our Best Songs of 2018. You will also find multiple songs from the exceptional Janelle Monae, Leon Bridges, Kendrick Lamar (via the stellar Black Panther soundtrack), the seminal Stephen Malkmus (and the Jicks), Neko Case, Car Seat Headrest, The Decemberists and the welcome return of Wye Oak. Finally, you will find phenomenal newcomers Snail Mail, Saba, Stella Donnelly, Miya Folick and Rainbow Kitten Surprise. As you will hear, it’s been a great first half of the year for songs. Let’s hope the year finishes just as strong.